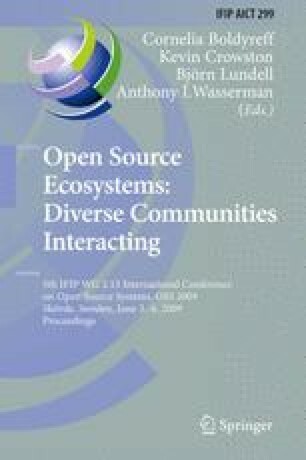 Free/Libre/Open Source Software (FLOSS) practitioners and developers are typically also users of their own systems: as a result, traditional software engineering (SE) processes (e.g., the requirements and design phases), take less time to articulate and negotiate among FLOSS developers. Design and requirements are kept more as informal knowledge, rather than formally described and assessed. This paper attempts to recover the SE concepts of software design and architectures from three FLOSS case studies, sharing the same application domain (i.e., Instant Messaging). Its first objective is to determine whether a common architecture emerges from the three systems, which can be used as shared knowledge for future applications. The second objective is to determine whether these architectures evolve or decay during the evolution of these systems. The results of this study are encouraging: albeit no explicit effort was done by FLOSS developers to define a high-level view of the architecture, a common shared architecture could be distilled for the Instant Messaging application domain. It was also found that, for two of the three systems, the architecture becomes better organised, and the components better specified, as long as the system evolves in time.